Victorious at Newbury last time out for Nicky Henderson, Gold Present was up 5lb but was strongest at the finish. Walk In The Mill made a bold bid to provide Robert Walford and James Best with a double but, approaching the last, Frodon had drawn alongside him. A huge leap from Gold Present, who landed running, gave him the momentum he needed and the 17-2 chance ran out a ready winner. 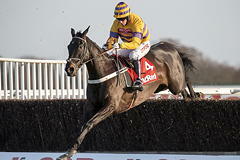 Henderson said: "He will be a National horse at some stage. He (Nico de Boinville) gave him a beautiful ride as he is not slow. It was his first try at three miles and they were going a good gallop all the way. "I ran him in the Topham last year, which was a brave thing to do with a novice. He got knocked over more than fell over. It's not beyond the possibility that the National will come into it at some stage. He does look to have the attributes for it. "It just looked a nice race for him to step up to three miles for the first time on nice ground. I will talk to the owners and we will dream up another idea somewhere. There is no rush, as he is a lovely big horse. "Since he has gone over fences he has improved dramatically and is going the right way." Paul Nicholls said of Frodon: "That was his first time over three miles. He was a bit keen, but he is a tough little horse. He has run really well and has been crying out for this trip." Mr Medic collared long-time leader Rock On Rocky in the final strides to win the My Pension Expert Handicap Chase and continue the purple patch of Walford. Rock On Rocky had seen them all off under a fine front-running ride from Stan Sheppard, but Mr Medic loomed large over the last under Best. A slightly better leap from Rock On Rocky appeared to have given him the final advantage, only for Mr Medic (10-1) to stick his neck out and win by a short head. Walford said: "That was amazing and the horses are going very well. "He was very brave and dug deep, he was absolutely brilliant. Jumping the last I thought he had a chance, but then going away from the last I thought it was all over. "There was a little question mark about the ground but I was not too worried, he's still a young horse and is growing up. "We've a few plans, but we're keen to keep them quiet."